Accepting snakes: why I want to but I cannot. 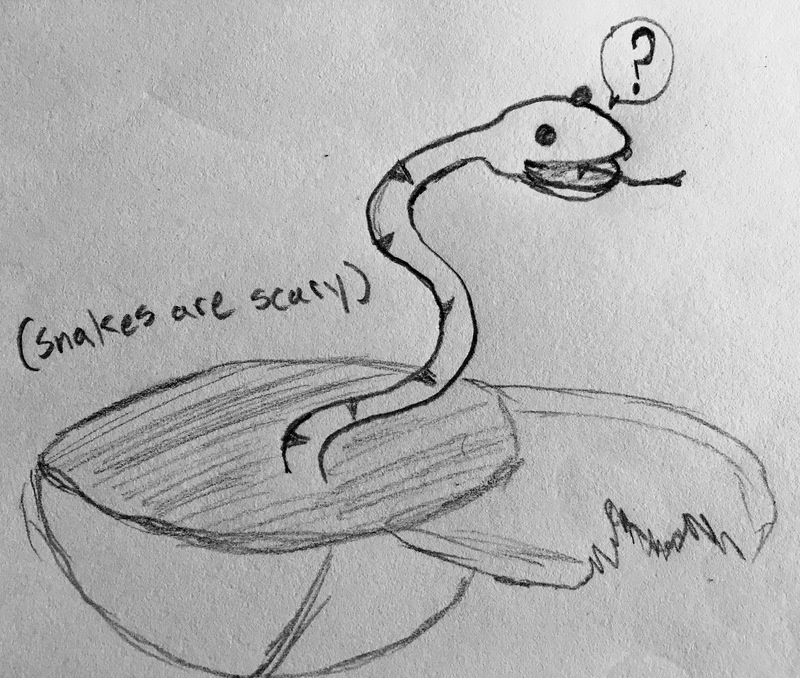 Snakes are horrifyingly terrible terror serpents who I assume only exist to make life for all other living organisms in the forest more difficult and exhausting. I apologize for that very aggressive introduction, but snakes and I have a long, horrible history, and that history is almost completely based off snakes intruding on my personal space (mentally and physically) and harming me (mentally or physically). When I push my emotions to the side and truly contemplate snakes as creatures in the forest (as they well deserve), I know they exist for reasons that are likely too complex or important for me to thoroughly understand and process. Snakes have a purpose. I know this. However, I wish I knew that the importance of this purpose outweighed my aggressive loathing for them. I cannot figure out their purpose, though. Why are snakes here and why does the forest need them and why can they not just leave me alone and exit my mind and my cave and never come near me ever? I asked other creatures of the forest why snakes existed. I received varying answers. A opossum screeched at me (I assume she is afraid of snakes, too). The anthill I asked seemed neutral on the subject, responding mostly in silence and very organized rows of many, which makes sense given that ants seem to only care about ants, dirt, and how ants interact with dirt. Rob (the squirrel) (from whom I did not expect a rational or just answer) said that snakes have only one purpose: to be questioned about by me. He then laughed at me and stole an acorn I had found. I also asked a lizard. My thinking was that lizards look quite similar to snakes (except for the legs and discernible body/tail and generally pleasant disposition), so perhaps lizards had more insight on the subject. The lizard said that everything has a purpose in the forest, and that often the purposes are very subtle and involve food. He added that these purposes only exist in the construct of the forest and have no value outside of the forest and, therefore, meant almost nothing on any scale larger than the forest so making cosmic sense of anything was ultimately futile and a waste of time. I liked the first part of the answer (it was difficult to consider the second part because of the food part of the first part), but it did not help. Are snakes food? Do snakes make food? Should I eat more snakes? Snakes are a part of life. They always have been. They always will be. No matter how much I want snakes to not be a part of life, there is no changing these facts. I have to learn how to live with snakes. Or I have to begin eating all snakes (which I do not want to do because they have pointy teeth and the few times I have eaten snakes I felt a deep, uneasy essence in my being that I was unable to get rid of for days, even weeks on in). Maybe I can just try to talk to snakes. I do not think I have ever done that. Maybe understanding snakes is like understanding any other creature: you just have to get to know them personally. And not eat them or assume they exist only to ruin your life. Also, thank you to everyone who participated in the survey-based adventure Bear embarked upon on Twitter last week. Thousands of you voted to help him decide what basic decisions to make about his day. It was very fun, and he hopes to find time to do it again soon. I talked to a snake and it bit me. This entry was posted in Bear thoughts and tagged @a_single_bear, bear, bear thoughts, bears, blog, contemplate things, humor, nature, purpose, snake, snakes, tags, twitter, why, yes on November 2, 2015 by A bear. Bear, not all snakes are mean or poisonous. Never judge a book by it’s cover. What’s on the inside is what truly matters. If you want to be rid of the snake, perhaps if you tell it to go away face to face it will never ever come back….just say the words… You are a bear.